i figured this building needs its own thread, since a redevelopment plan seems imminent. Swords said Sunflower has the 1963-era building under contract and hopes to begin a $55 million redevelopment plan next year. The plan calls for 196 market-rate apartments above two stories of office/retail. Sword said the building hasn’t been renovated since the 1980s and needs to have windows and mechanical systems replaced. He said all except one of the few remaining office tenants are on month-to-month leases. The $69 million redevelopment project also calls for retail on the first floor, office on the second floor and a rooftop pool and amenity deck. Mark Moberly, director of development for Sunflower Development Group, said other amenities, all in the basement, will include bicycle storage, a fitness center, a golf driving range simulator, social lounge and two movie rooms, including one in the old Traders Bank vault. "In addition, we are discussing the concept of a 'smart apartment,' using the latest technology, such as Nest thermostats, smart LED light bulbs and Bluetooth Low Energy door locks," Moberly said. Helix Architecture + Design is working on plans, Moberly said, and the developers are expected to select a general contractor within the next 30 days. Assuming that planning and incentive hurdles are cleared, construction could begin in July, allowing a January 2018 opening. Is it asking for any incentives? A better use for that building. DT office space continues to shrink as residential increases... not that suburban companies interested in moving downtown anyway. Nice to get more residential/hotels along Grand and to east. they will probably ask for an abatement. good news is that they're meeting with jurisdictions already. sunflower is good at that. my friend that works there said they have been in doing environmental work, probably to test for asbestos? Does locking that property up as parking for the traders building affect the potential development of the site into an office tower? Isn't that surface lot where the office tower is proposed? Although I suppose the new office tower would have a parking garage that the traders building could share. With all these buildings going residential, I can't believe there would not be some demand for new construction office space downtown. Office towers are now going up again in most other cities (downtowns), so hopefully KC will see some action as well. GRID wrote: Does locking that property up as parking for the traders building affect the potential development of the site into an office tower? Isn't that surface lot where the office tower is proposed? Although I suppose the new office tower would have a parking garage that the traders building could share. copaken already allows tenants to park there. whatever is built would probably have structure parking anyway. I'm not sure if these pictures would be of use to anybody, but I found myself in the Ambassador yesterday and figured I'd take a few pictures of the north side of the ToG building from 5 stories up. If you look closely at the interior you can see the ceilings are already ripped out in some places. Maybe that's for the environmental work going on? 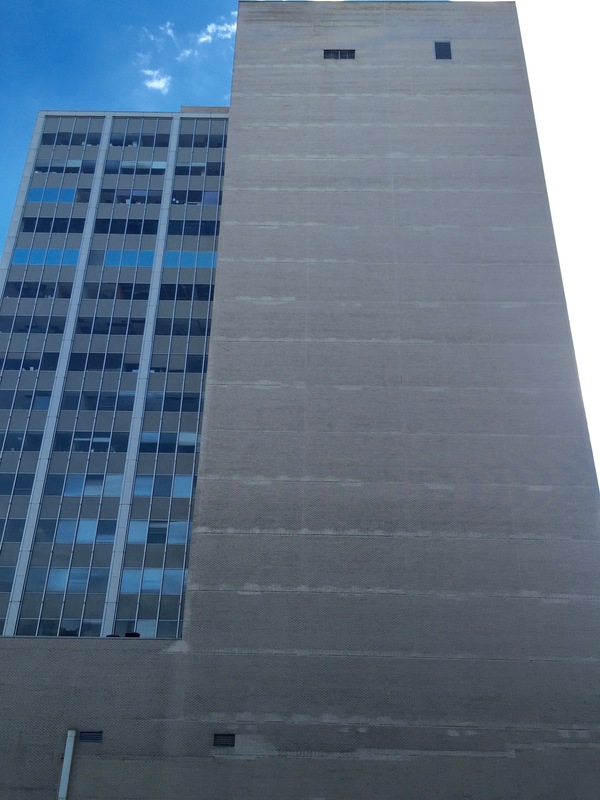 It's always a bummer to see the scar on the side of an extant building from where its lost neighbor abutted it. Eon Blue wrote: It's always a bummer to see the scar on the side of an extant building from where its lost neighbor abutted it. This was a cool tidbit from the bizjournal article. Stephen Block, a BRES principal who leads the firm’s involvement in the project along with investment market broker Aaron Mesmer, said other amenities will include an outdoor off-leash dog park for tenants and a first-in-the-market service for apartment dwellers. a little birdie tells me they'll have between 10 and 15 electric cars. That brick wall looks terrible. 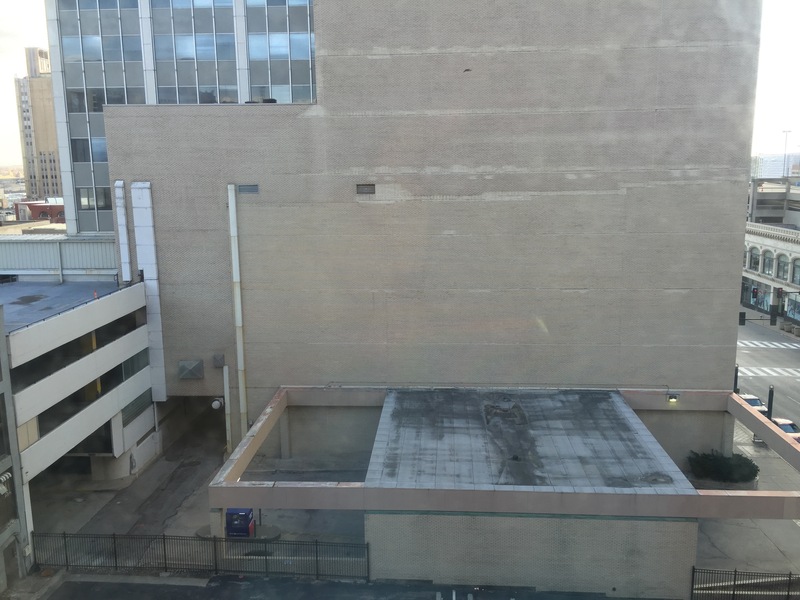 I hate the building all together, but the wall is the worst part. You can see the line of each floor by the spalling of the brick. Any word on facade changes?? kboish wrote: This was a cool tidbit from the bizjournal article. 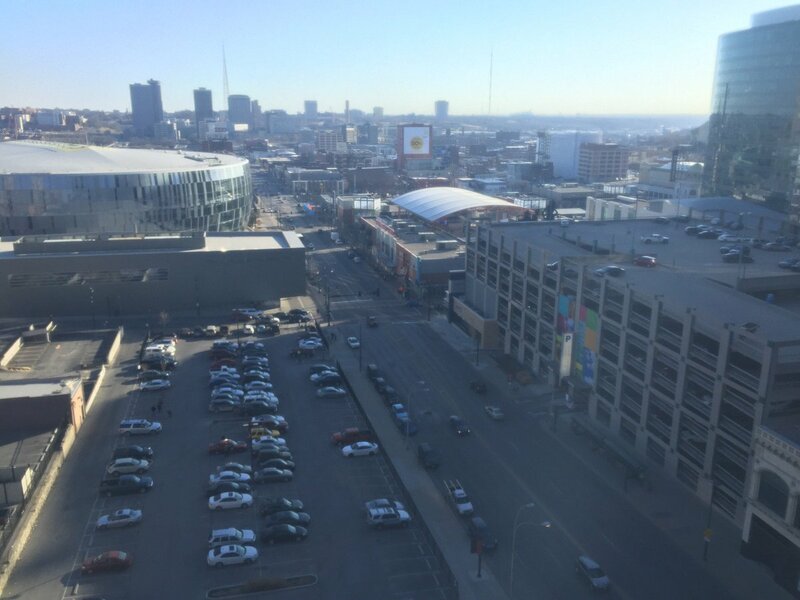 I don't mean to be the debbie downer, but what is the use of a car share fleet if everyone who resides in the building has to drive to JoCo or Cerner to work? Increasingly I'm becoming concerned that jobs are not following rooftops to the city. I hope I'm wrong and what we're experience is just the lag time in between. it might help a household of two who already work downtown get rid of one (or both) cars. Honestly, I think it will take a whole generation to change downtown back into the major location for business in the city. It's much easier to get people to come DT for a restaurant or show, or even get 10-20,000 people to move to the city. But, to get a mature business to move to the city, it takes close to a majority of employees accepting the move and the older leaders wanting to move that direction as well. On the bright side, it's inevitable that it will happen and, if you stay here long term, you'll have a front row seat for the continued rebuilding of a city. Not many people ever get that in their lifetimes. If there aren't enough parking spots for all units, then they'll simply have to market this particular building to those who do work within downtown or workplace directly on a bus route - or retired people. Permanent 'work from home' also significantly picking up with many companies (I do and bus to work if I needing to go in - only a few times a year). Both me and my partner live and work downtown. In the past year we have gotten rid of one of our cars. We are discussing getting rid of the other car. This would make it that much easier to get rid of the car because the biggest thing is going 10+ miles for an event or our bi-monthly costco trips. ULCajun wrote: Both me and my partner live and work downtown. In the past year we have gotten rid of one of our cars. We are discussing getting rid of the other car. This would make it that much easier to get rid of the car because the biggest thing is going 10+ miles for an event or our bi-monthly costco trips. That is true. if you move into the building. Which, perhaps you will. I agree it will help some people--I would in fact be in the same boat as you if I lived in the building. I already mostly walk everywhere and could easily live carless if ZipCar were downtown. I'm just concerned about all our office buildings becoming apartments. Again, hopefully we're just in the lag period between influx of residents and influx of offices. Hollis & Miller is a good bright spot, for example. I think we are seeing the shift finally. The KCATA's 3rd and Grand lot is a prime example. Initial talks were for multi-family, but it ultimately changed over to office. BTW, my prediction for that lot is BNIM. Potential for signature multi-modal, green development (likely with incentives), too easy. They will need an interim site though. Maybe old populous spot in RM? Another example is Corrigan station- initially planned for rez, but shifted over to office.